After a month of stunning declines (in April) across the board in consumer litigation, the numbers came roaring back with equally stunning increases in May. The end result? Everything is pretty much back on track, in line with last year and years prior. FDCPA had the weakest comeback, with only (!) a 20.7% increase over April. FCRA was next with a 41.7% increase, and TCPA led with a 43.5% increase. Year-to-date, FDCPA is the only one still down a bit from this time last year, trailing 2016 by 2.3%. TCPA is up slightly, with a 1.5% YTD increase and FCRA is stealing the show so far with a 9.7% YTD increase. After the last few years of TCPA being the most aggressive growth property, maybe the consumer bar is ready to really test new consumer reporting theories. 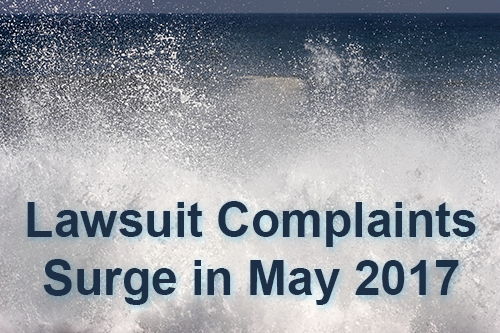 In contrast to consumer litigation May saw a slight dip in CFPB complaints over April, down 3.7% from last month. That is the second monthly decline in a row, though April’s decline over March was much larger at 12.7%. Even so, these two monthly declines did nothing to stem the YTD complaint explosion so far. The total complaints have increased to 26.9% over this same time last year. Back to litigation, putative class actions were uneven last month with 24.1% of FDCPA, 13.5% of TCPA and 10.3% of FCRA lawsuits filed that way. And finally, New York attorney Craig B Sanders keeps the crown another month for representing the most consumer plaintiffs (83) in May, and also for representing the most consumers year-to-date (257). Of those cases, there were about 1561 unique plaintiffs (including multiple plaintiffs in one suit). Of those plaintiffs, about 527, or (34%), had sued under consumer statutes before. About 901 different collection firms and creditors were sued. There were 4012 complaints filed against debt collectors from May 01, 2017 to May 31, 2017. This includes 3815 (95%) timely responses to complaints, and 197 (5%) untimely responses.